During a rally in Karnataka's Koppa, Kumaraswamy asked people not to believe Prime Minister Modi's colourful words which are aimed at gaining votes. 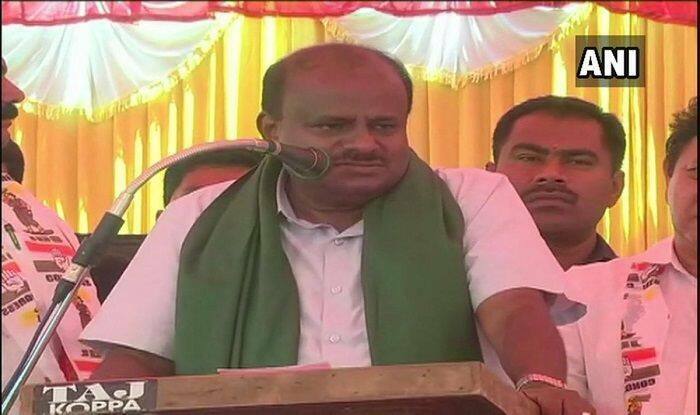 Bengaluru: At an election campaign in Karnataka’s Koppa, Chief Minister HD Kumaraswamy requested the people to not believe Prime Minister Narendra Modi’s colourful words. He said, “Why should we have enmity with neighbouring countries? Two years ago a military officer told me PM will build a story before the election to get votes. They don’t ask for votes on development work.” On Thursday, the Chief Minister prayed at Sri Durgaparameshwari Temple at Sowkooru village in Udupi district after which he left for Koppa in Chikkamagaluru, stated a report. On Friday, Kumaraswamy accused coalition partner Congress and others of hatching a ‘chakravyuha’, a deadly formation in epic Mahabharata, to defeat his son and JDS nominee Nikhil in Mandya Lok Sabha seat. Bringing to fore again deep fissures in the ruling front, the JDS leader lashed out at Congress and others for ‘colluding’ with the independent candidate and multi-lingual film actress Sumalatha, wife of late Congress leader and actor Ambareesh, in Mandya, instead of working for Nikhil. “There are developments that have gone out of hand in Mandya. The independent candidate has got widespread support. She may appear as an independent but she has got the support of Congress, BJP and Raita Sangha (farmers’ association). All of them have joined hands to trample JD(S),” he told reporters in Chikkamagalur. Last month, the Karnataka Chief Minister launched a scathing attack on Prime Minister Narendra Modi after Income Tax officials and CRPF personnel carried out raids at the residences of state Minor Irrigation Minister C S Puttaraju and his nephew. “PM Narendra Modi’s real surgical strike is out in the open through IT dept raids. The constitutional post offer for IT officer Balakrishna helped the PM in his revenge game. Highly deplorable to use govt machinery, corrupt officials to harass opponents during election time,” the chief minister said in a tweet.